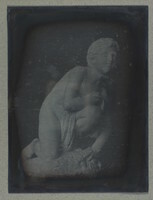 Daguerreotype consists of only backing and plate, which are separated. Coverglass missing. It´s hard to see how the original backing assembly has been, but åpossibly the blue paper on the pressed wood board has been used as binding. Beside the silver content number is a "GARANTIE" mark.